The idea of using local produce has revolutionised the culinary world in recent years, nowhere more than in Scotland. 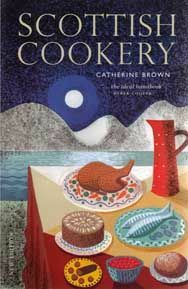 From juicy-sweet berries to the finest tasting native-bred beef, Catherine Brown's acclaimed Scottish Cookery lets the best ingredients from Scotland's rich natural larder speak for themselves in hundreds of mouth-watering and imaginative recipes. As before, this new edition blends the nation's history with the practical advice of a working cookbook. As well as a feast of new recipes reflecting modern influences on kitchen methods and ingredients, there is a wealth of practical advice and an updated Buyers' Guide for sourcing Scottish produce.